On any measure of Old Testament saints, David is in the first-tier, along with Abraham and Moses. The name "David" appears to be connected with the Hebrew verbal root "to love," so his name probably means "beloved." He is an amazing, multi-faceted, multi-gifted person. First, he was a musician, "the sweet psalmist of Israel" (2 Samuel 23:1). As a youth, he practiced the harp on the sheep fields of Bethlehem. As a young man he became a court musician for Israel’s first King — Saul. But as he grew, he began to write down the inspired songs or psalms that he wrote, so that his own compositions fill nearly half of the Book of Psalms. But more than just a prolific lyricist and musician, David was a worshipper. His music wasn’t just popular love songs. It was worship. It comprised the intense emotions of struggle and the high freedom of praise and everything in between. Music gave voice to David’s faith and his soul-felt prayers. Most musicians I know are gentle, artsy people. But David was the opposite. He was a renowned warrior, the most famous warrior in the history of Israel. His courage to stand up to and defeat Goliath is legendary. Saul made him an officer in his army where he began to win battles — not by standing back and giving orders, but by leading his men into battle himself, defeating his foes by the strength of his arm — and his faith in God! When Saul became jealous and began pursuing David, he gathered a band of 400 men, then 600, whom he forged into the fearsome army of a fugitive warlord. Because of his own courage and prowess as a warrior, he attracted the best warriors in the land to join him. David was a warrior. But there’s more to him. David was a nation-builder. Before him, Saul functioned as a local monarch over a loosely organized group of tribes. Through his own diplomatic efforts, David was able to unite these tribes into one nation. He conquered Jerusalem and made it capital of his growing empire. He built a palace, then brought the ark to reside in his new capital. Once he had consolidated power, David began to subdue the neighboring kingdoms that had pressured Israel’s borders. He turned them into his vassals — the Philistines, the Edomites, Moabites, and Ammorites. When he conquered Hadadezer king of Zobah, an Aramean overlord of kingdoms all the way east to the Euphrates River, David became king over an empire that extended from the Brook of Egypt in the Negev Desert east to the great river. David was a nation-builder. There is more on this man who had a heart after God. First, I would like to share this personal testimony with you. I am blessed, healed, and highly favored by God! That statement is my faith in God today. My job is a very demanding job concerning my time. I don’t get to attend church services as I desire, BUT GOD has blessed me to connect online; I must say this, I do go to church when I can. God has blessed me to connect online with other Christians, pastors, and prayer warriors. It is such a blessing! I said that to say this, these Bible studies has been a tremendous blessing for me as to studying God’s Word, researching for God-given knowledge on His Word, reading the Bible daily, meditating on each study, and many other blessings. So, now, we come to our new Bible study. 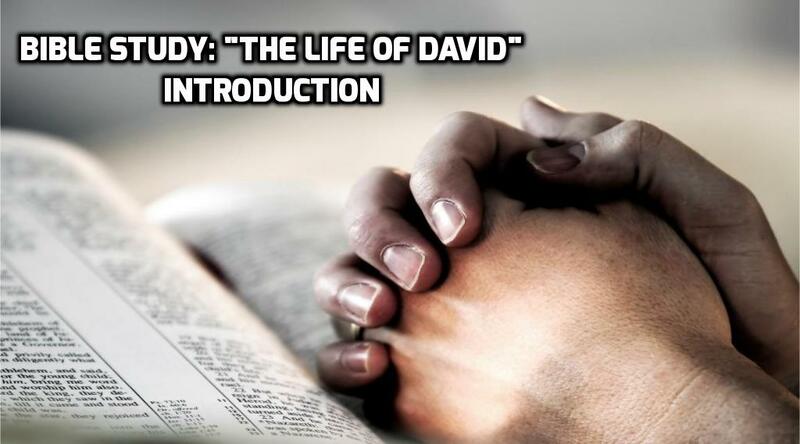 In this study we will be looking at the life of David. We will have prayers, psalms of David, questions, quizzes, prayers of David, and a look at our own character, obedient, and fellowship with God. Some material is (by Nathan L. Meyers).